Three years ago, on Thanksgiving eve, I was asked via a Facebook post from a friend to volunteer to serve food at a free Thanksgiving dinner. I had no idea when I walked into the kitchen, that I was walking into much more than a dinner. There are so many amazing people in this city that are Pittsburghers. Sometimes I am lucky enough to get to spend some a few moments with those people. Tonight, I helped a friend clean up from the community dinner that has been organized at the Albright United Methodist Church since the 1970s. The volunteers were led by a man that is 75 and has worked at Ritters for over 40 years. Earlier this year, he left Ritters and now works at Dennys. Today he cooked 9 turkeys and all of the fixings. Tomorrow he will feed 35 people at his house, then go to work at Dennys at 5pm. I have helped with the clean up for this dinner for the past 4 years and never had the chance to hear this story. I’ll gladly wash the pots and pans, and mop the floor any night of the week if I get to spend time with Pittsburghers like this. On top of that, another kind Pittsburgher saw my post on Reddit about volunteering a the dinner and showed up to volunteer with out having heard of me or my blog. He had taken a quiz on Facebook and learned that today was his 10,000th day alive. To celebrate that, he spent the evening helping a few strangers. That is just a little slice of Pittsburgh for you. The Albright Community Thanksgiving-Eve dinner is more than making sure everyone has some turkey and stuffing to eat on Thanksgiving day (many folks take home an extra meal in a to-go box), but it is an opportunity for people, neighbors, from all over this city come and sit at the table together for food and conversation. If you have been following IheartPGH over the past few months, you know there have been many posts about the future of the Albright Church Building, while I care very much about that conversation, I think it is most important that the focus of the next week be on making sure that everyone in Bloomfield, Shadyside or any other corner of this county has a warm Thanksgiving meal and some neighbors to talk with at dinner. Help Make the 41st Annual Albright Community Thanksgiving Dinner a Success! 1. Plan to attend the Thanksgiving Eve Dinner! This is a free meal and all are welcome to attend if you need food, fellowship or just an excuse to meet your neighbors please plan to attend the meal. You can RSVP on Facebook Event here. Download a flyer to print here. 3. Volunteer to help prepare this home cooked meal! Volunteers are needed to help cook, serve and clean up after the dinner. 4. Donate! You can support the Albright Community Thanksgiving Eve Dinner by making a financial contribution to Friends of Albright. Friends of Albright’s fiscal sponsor is New Sun Rising and all donations are made to the group through New Sun Rising here. Forty years ago, one of the boy scouts who attended Albright planned a free Thanksgiving meal for his Eagle Scout Project. Ever since, the congregation of Albright United Methodist Church has continued to serve a free Thanksgiving meal. 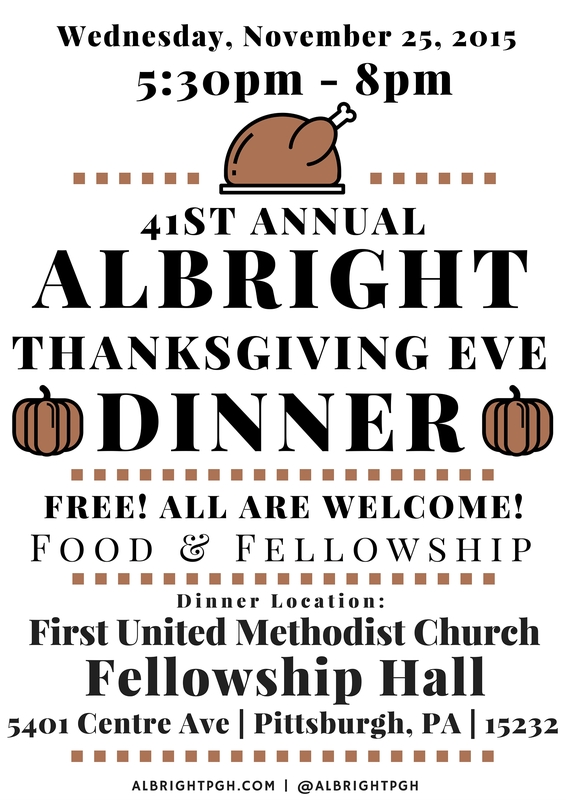 Starting in 2014, Albright began holding the annual Thanksgiving dinner in the fellowship hall at First United Methodist Church, which is located just around the corner from Albright.